There's a common misconception about all-wheel drive -- or, for the vehicularly illiterate among you who don't understand the difference between drivetrains, the capacity to transfer power to the ground using all four wheels at variable rates depending on conditions. AWD was once a relatively niche thing associated with the likes of Audi and Subaru, but now? It's an option on everything from minivans to sport sedans. To be clear, I have no problem with AWD or its ever-increasing ubiquity, but I do take issue with the rationale behind its popularity. People are buying AWD cars based on the notion that they're easier to control in inclement weather -- and therefore safer -- than their front- or rear-wheel-drive counterparts. While that statement isn't 100% false, it’s not 100% true either. 4-Wheel Drive vs. All-Wheel Drive: WTF Is the Difference? To help clear up this AWD confusion, I headed north: past the Arctic Circle, to the very northern tip of Finland, in the dead of winter, to a place known simply as "White Hell." 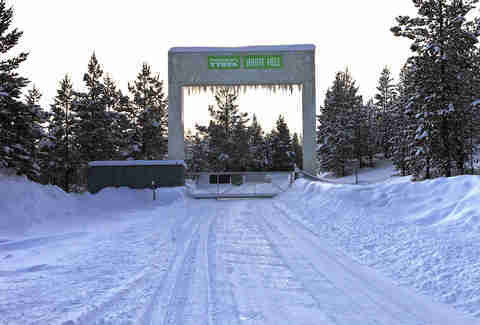 Nokian Tyres (or Tires, in American) asked me if I wanted to come check out its winter tire-testing facility. Of course I accepted, eager to play, er, excuse me, engage in some highly educational driving activities. Driving conditions don’t get much more inclement than this, people. Also, meet Nokian's resident mannequin. I have no idea what he (or she, I didn't check) did to deserve this fate, but his sole job is to get run over, as you'll soon see. I don't know why, when, or how this myth got started -- and maybe the people who believe it vary by region and what kind of weather they get -- but many drivers seem to think that, because you can accelerate better on snow and ice with all-wheel drive (yes, that much is true, for the most part), you can stop better as well. That part's not so true. The video above shows an Audi Q5, sporting all-season tires. Watch the driver slam on the brakes at 30kph, or roughly your speed through a school zone. The evidently moronic mannequin is now standing in the proverbial line of fire (not coincidentally, at the same spot where an identical Audi with proper winter tires came to a stop). Suffice it to say the result is hilariously not pretty for mannequin fans. Here it is again, but from the perspective of being on board the Audi this time. It drives home that helpless feeling almost everyone has had when you hit the brakes and... nothing happens, because you don't have traction. Listen to the sound of the ABS activating as soon as the driver hits the brakes, about two seconds in. This is a truly state-of-the-art modern vehicle doing everything it can to stop in as short a distance as possible, and it can't overcome the difference in grip. 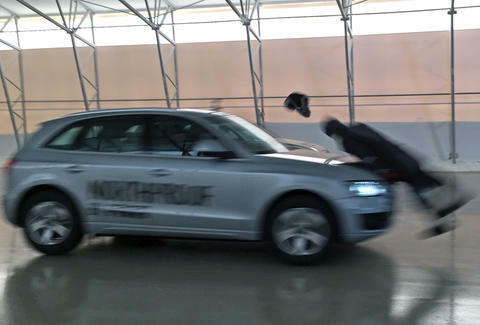 Now, watch that other Audi Q5 perform the exact same test; the driver slams on the brakes from the same distance. The only difference? Instead of all-season tires, this one is outfitted with proper winter tires. 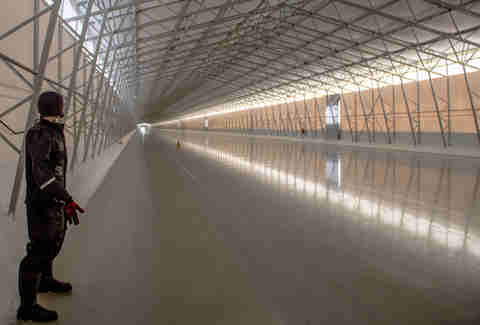 They feature specialized pattern-molded rubber to dig into snow and ice, and the rubber itself is uniquely formulated to achieve optimal grip in freezing temperatures. Fair warning: it's a boring video, because safety is usually boring. The difference in stopping distance (shown here) between a tire meant for slick conditions and one meant for a wide range of conditions is absolutely staggering, even to me, and I knew roughly what to expect. Your car’s electronic stability controls are there to keep you safe. They'll act in roughly the same way for front- or rear-wheel-drive cars as they will for AWD. The problem with that is, it totally negates the AWD advantage. Take a turn too fast? What you want to do -- take advantage of your AWD by getting into a controlled slide and using throttle to get out of the corner -- and what your car’s built-in computers actually do, are worlds apart. The computers cut the throttle, and even apply brakes until you're slow enough to be "under control" again. Driving a mile down the road, going to work or dropping the kids off at school, very few people turn off their electronic stability controls. Rightly so, since they're there to help. But while AWD can be hugely beneficial for control, very few drivers can properly take advantage of it. I had the privilege of driving a couple of laps of Nokian’s ice course at White Hell -- a test track literally carved into a frozen lake. Nokian's people trusted me enough to turn off all electronic aids. With good tires and no computers, suddenly all was right in the world. Aaron Miller is the Cars editor for Thrillist, and can be found on Twitter. He misses Finland already.